Skylanders: Ring of Heroes will globally launch on February 27th! Skylanders: Ring of Heroes will launch globally on February 27th PST next week! Global Release will be for selected countries. Additional countries, including Asia, may be implemented in the future. One of the most frequently asked questions we’ve gotten is about adding more Skylanders to the game. We updated the number of Skylanders from 65 to 84, adding more elemental variety with characters like Wild Storm and Chain Reaction. Skylander’s skills, both the effects and animation, have been improved to look and ‘feel’ more distinctive. 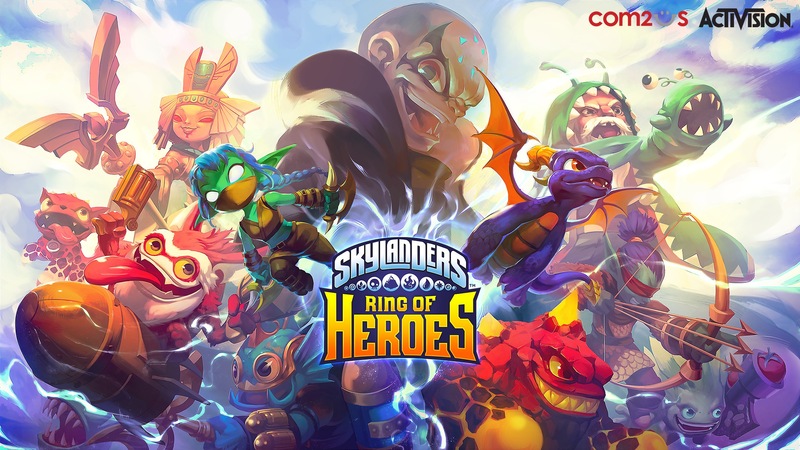 We’d also like to announce that new, original characters made especially for Skylanders Ring of Heroes are being developed for a future update, so stay tuned for more info! We read feedback that showed us that players were feeling stumped and discouraged with the original battle system and we understand that frustration. As a result, we decided to do some tweaking to various systems to see if it could help alleviate some of the problems. We know how important lore and a solid story is to some fans so we’ve expanded the storyline by adding more cut scenes to deliver a more lively experience similar to the original Skylanders series. By clearing Adventure stages, you can unlock and view new parts of the story as well as re-watch them from the ‘Replay’ tab, but don’t lose hope just yet! More of the story will be added as we continue to update the game. Here, you can see the 'Replay' tab we just spoke of. Guilds will allow you to interact with Portal Masters from all over the world! You can receive achievements and rewards like guild level-ups by completing guild missions with your guild-mates. You can also support one another by requesting AND donating Soul Stones. You can gain guild points and use them in the Guild Shop to purchase Swap Scrolls as well as purchase Surge Statues, which grant unique effects to your battle party to make them even stronger. Be sure to join or create a guild so you can build a stronger team and a stronger bond with your friends! This is what the 'Guild' menu looks like after you've joined. Be sure to check the 'Notice' under the description for important guild-related info. We heard users wanted more dungeons to farm so we started to develop the Cave of Gold shortly after the beta test period ended. In the Cave of Gold, you have another way to earn gold, which is needed to help power-up, Evolve, and make Skylanders stronger. This dungeon can be done every day! We also changed the rewards given for completing various stages in The Realm of Souls as well as the Mirage Tower. The 'Cave of Gold' is the newest addition to the 'Challenges' menu. Along with the rest of the beta test feedback, one that was mentioned a lot was that we add more character customization. We are pleased to announce that Portal Master Customization is now available. You are now able to edit your hairstyle, eye color, and skin tone which will allow you to create a Portal Master with their own unique style. We’re also working on a variety of NEW hairstyles and costumes that will be implemented after global release. We’ve updated the ‘Quests’ tab so that they will better assist newcomers to the game, by helping them level up and settle in. By clearing each mission step-by-step, Portal Masters will not only learn how to play but also be rewarded with special items and incentives that are only found in these “Quests” training missions. We put lots of time and effort on the graphics, UI/UX (User Interface/User Experience), and quality of life improvements. However, one of the hardest tasks that the Skylanders team was faced with was preparing a system that would allow Skylanders fans to collect,level-up, customize skills, and battle with all of their favorite characters. We’ve been developing ideas to improve Skylander growth, as well as thinking of different ways to improve content, while also rewarding players for doing so. Even if we can’t answer every question, our first priority will always be what’s best for the game and the players. Feedback will always be considered when making changes. Below are a few more summarized questions and concerns from users. 1. Will there be one or multiple servers? When global release occurs, servers will be divided by regions. Global and European servers will be added. Canada, New Zealand, and Australia will keep their servers as they are. 2. Is any new content going to be available for global release? New content that will allow you to play the game with Portal Masters from all different parts of the world such as Guild Raids and other co-operative content are still being prepared to be available soon after global release. We will update the community with further details! 3. Toys-to-life and Portals were one of the biggest parts of the Skylanders franchise. What was the reason why Skylanders Ring of Heroes ruled out this feature? The Skylanders Ring of Heroes team thought really hard and deliberated for a very long time, and they ultimately wanted a game that everyone could play and have access to. That meant that some Portal Masters from regions that are not familiar with the Toys-to-life model, would not be as familiar with the gameplay style. They may also have a hard time getting their hands on toys, and they might not be able to enjoy the game to its full potential. This decision was not taken lightly as we’re very well aware of how beloved the toys are. We would like to ask that Skylanders fans understand that our main goal was (and still is) “making a game that users across the world can enjoy”. We are preparing a distinctive battle system, a variety of original series characters, and newly expanded content to be updated soon. We will notify everyone of the new, upcoming, challenging content while also making sure we compile and consider ALL user comments and feedback. We will strive to keep bringing you an even more interesting and fun game. Thank you all for your steadfast dedication, your patience, and for sticking with us. We hope to see you during our global release! Skylanders: Ring of Heroes to be released in NZ, AUS and CAN this week! Com2Us has announced the release dates for Skylanders: Ring of Heroes for Australia, New Zealand and Canada, and they'll be released in those regions this week. No word yet on the release date for the other regions. 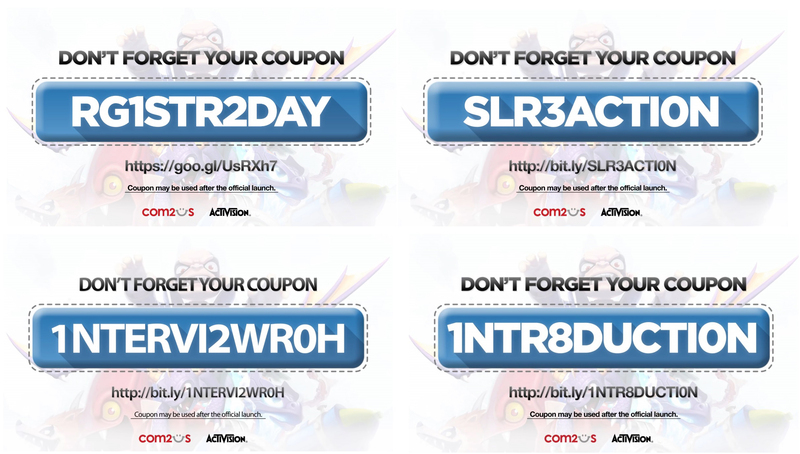 Don’t forget to use the coupon codes or links to get rewards when you get the game! Ring of Heroes Pre-registrations open! Pre-registrations for Skylanders: Ring of Heroes are now open. Those who register will receive gems for a Luxury Summon and Gold. The more people that register, the more rewards they'll get! You can also pre register on Google Play!